Minority borrowers in Illinois may be eligible for compensation under a settlement with now-defunct Countrywide Financial over its discriminatory lending practices. But they have only a few days left to submit paperwork to get a piece of the settlement. Bank of America, which bought Countrywide in 2008, has agreed to pay $335 million to customers affected by the racial discrimination committed by the former lender when making home loans. The U.S. Department of Justice sent letters and claim forms to the more than 200,000 people nationwide who are eligible for compensation. To receive a check, those eligible must submit their forms by March 29, this Friday. “The relief obtained in this settlement is crucial for borrowers who’ve paid far too high a price for the risky, discriminatory lending practices Countrywide employed in the buildup to the housing collapse,” said Illinois Attorney General Lisa Madigan, who filed a discrimination suit against Countrywide in 2011. “I encourage anyone who has received information from the settlement administrator to act quickly to submit their claim before the deadline.” Madigan’s suit was ended by the federal settlement, which calls for at least $20 million to go to Illinois. The DoJ says during that between 2004 and 2008, Countrywide lenders charged minority borrowers more in fees and other costs. According to the settlement, black and Hispanic borrowers were also more than twice as likely to end up with expensive subprime loans with ballooning interest rates than white borrowers with similar credit scores. “The steered Hispanic and African-American borrowers [who got subprime loans] paid, on average, thousands of dollars more for their loans and were subject to possible prepayment penalties, increased risk of credit problems, default, and foreclosure,” said the federal complaint. The settlement applies to 41 states and the District of Columbia. But the DoJ focused in on Chicago as one of the examples used in its complaint against Countrywide. “In 2007, Countrywide charged a retail customer in Chicago borrowing $200,000 on average about $795 more in non-risk-based pricing adjustments if he were Hispanic, and an average of about $460 more if he were African-American, than the average amount charged to a non-Hispanic white borrower,” the compliant said. The DoJ said that at the same time, African-American and Hispanic borrowers in Chicago were also paying about $1,000 more in fees than white borrowers on the same kind of loan. The letters sent to those eligible for the settlement included a minimum amount that borrowers can expect to receive. The payouts range from $200 to $15,000. The higher amounts will go to the more than 12,000 people who were given sub-prime loans despite their solid credit histories. The final amount each borrower would receive will be determined by how many people respond by the deadline, after which the settlement will be sliced up among those that submitted to proper paperwork. Borrowers who have questions, need help with their submission or need a new claim form should contact Independent Settlement Administrator Rust Consulting Inc, a contractor hired by DoJ to oversee the settlement. The administrator can be reached at (800) 842-5148 or by email at countrywide.settlement@usdoj.gov. Illinois residents can also call Madigan’s Homeowner Helpline at (866) 544-7151. For more on the settlement, see Illinois Issues February 2012. The Countrywide discriminatory lending settlement is not to be confused with the $26 billion foreclosure settlement approved in 2012. That agreement came in response to the nation’s largest lenders engaging in sloppy and sometimes fraudulent foreclosure practices, such as signing off on documents without verifying information, a practice known as robo-signing. Illinois is expected to receive $1 billion in that settlement, and most of the money is supposed to go toward keeping struggling borrowers in their homes. More than half of Illinois school districts will spend more money than they have this fiscal year ,according to analysis from the Illinois State Board of Education. According ISBE report, more than 570, or about 67 percent, of schools will deficit spend this fiscal year, which ends in June. That number has increased from 425 districts, or about 48 percent last fiscal year. The analysis ranks schools on their fiscal stability based on factors such as how much cash a district has on hand and its debt load. More than 100 school districts have dropped out of its highest ranking category since last year and the number of districts in the lowest category, called financial watch, has doubled, going from 17 districts to 45. But 13 percent of Illinois districts fell in the bottom two rankings, up from about 6 percent last year. The number of districts on the financial watch list decreased each year from 2004 to 2009. The number went up in 2010, declined in 2011 and 2012 and spiked under the current analysis. (Financial rankings for all of the state’s school districts can be found at ISBE’s website.) This is the 11th year that ISBE has done such an analysis. The rankings have been changed to account for slow payments from the state to schools districts. The state currently owes schools more than $630 million. According to ISBE, no schools are put on financial watch based solely on late payments. Gov. Pat Quinn’s budget proposal would cut K-12 education by $275 million from current fiscal year levels. Quinn said growing pensions costs necessitate cuts in education. “Skyrocketing pension obligations leave our state with no choice but to continue reductions to our core priorities,” Quinn said when he presented his budget plan. He is calling for early childhood education to be spared further cuts. Supporters of efforts to cut spending on public-employee pensions say they reached a turning point today, as the House approved reductions to cost-of-living increases for current and future retirees. “The meat and potatoes of pension reform happened today,” House Minority Leader Tom Cross said after today’s vote. “And I think this was the toughest vote people are going to face.” Lawmakers approved House Bill 1165 on a vote of 66 to 50. The measure would cap the amount of salary on which retirees could earn the compounded 3 percent cost of living adjustment [COLA] at $25,000. Anyone earning more pension income would receive a flat COLA of $750 annually. Under the bill, retirees would not be eligible for a COLA until they have been retired for five years or they reach age 67, whichever comes first. The bill also would apply to current retirees who are now receiving COLAs. “I know that this is a very difficult thing to do to retirees ... but unfortunately, we have let the problem get so big that that has to be the nature of the solution that we’re looking to,” said sponsor Rep. Elaine Nekritz, a Northbrook Democrat. The current COLAs are by far the costliest component of the pension plans. Nekrtiz and Cross said that they must be targeted to make a real dent in the $96 billion unfunded liability. While leaders of both parties in the House say the chamber made significant progress today, the Senate rejected a comprehensive proposal on Wednesday. Senate Bill 34, which is similar to HB 3411, fell seven votes shy of the majority needed to pass. The chamber instead approved a much narrower bill that would only apply to teachers. Senate President John Cullerton said that the measure was just part of an overall reform package he plans to present in the Senate. “The work of building a coalition of 30 votes is going to require more heavy lifting. I'm committed to this goal and look forward to passing a full reform plan this session,” he said in a prepared statement. Union leaders said they would continue to fight against the changes, which they say violate the state's Constitution.“We remain opposed to measures passed by the House and Senate this week. We will continue to advocate for coalition-supported solutions that have been negotiated with the unions who represent those affected by pension changes," said a statement from the We Are One Coalition. The presidents of four of Illinois' public universities testified today before the Senate Appropriations Committee, hoping to avoid Gov. Pat Quinn's proposed budget cuts for higher education. The universities said they were operating with growths in enrollment over the past decade, growing costs for employee health care and millions in deferred maintenance, all while facing cuts and delayed payments from the state. In his budget proposal for Fiscal Year 2014, Quinn proposed to further cut 4.9% in state funding for higher education. Al Bowman, president of Illinois State University, said reduced state funding had a direct impact on ISU and the ability of many students seeking a college education. “The impact on affordability is certainly something that we can’t ignore,” he said. He said more money is needed to provide some salary increases and maintenance updates. Recently, Moody’s bond rating agency revised credit ratings for some state universities, including the University of Illinois, the state's largest university system, citing debt concerns and reliance on state funds for their operating budgets. The U of I, with campuses in Chicago, Urbana-Champaign and Springfield, estimated it would lose $32 million in the next fiscal year under Quinn’s budget. University President Robert Easter said the U of I is still waiting on $480 million in late payments. He said the university hopes to receive flat funding this year instead of the cut in Quinn’s proposed budget. Several committee members pushed back against some salaries at U of I, noting the university budgeted for a $1.1 million total salary increase for its top 10 officials. “The increase in that could probably pay for three additional faculty members,” said Sen. Michael Hastings, an Orland Hills Democrat. Easter said some of the increased salaries were for medical faculty who are also being compensated for their work in medical facilities. Some of the employees who received raises, including Easter, had moved from temporary status to permanent employment. Governors State University asked lawmakers for additional funding beyond the $24.6 million it received this fiscal year. The university wants $2.5 million for a new building that would house classrooms. However, President Elaine Maimon said administrators would be glad just to avoid Quinn’s proposed reduction. “We requested a modest increase in the budget because we need it. However, we would be really pleased with a flat budget,” she told committee members. She said the school limited the freshman class that they plan to admit in 2014 and would like to be able to expand admission in the future. “Even with all we are doing to increase enrollment ... we really believe that if you could give us a flat budget, we could manage all of this and make the state proud of us." The president of Southern Illinois University, Glenn Poshard, said his university needed to continue to be able to provide a college education to students from more impoverished areas of the state. He spoke of the growing difficulty for families in southern Illinois to send their kids to college, due in part to the historic rise in tuition rates. He said for an average family in southern Illinois, the cost of in-state tuition for a single student was about half of the family’s annual income. The affordability gap “risks pricing students out of post-secondary education,” he said. SIU expects to see a $10 million decline in funds from the state in the next fiscal year. Poshard said the state has paid about 21 percent, or $42.8 million, of the $204 million it owes the university the current fiscal year. The Illinois House sent a bill to Gov. Pat Quinn today that could mean rate hikes for customers of the state’s two largest utility companies. Senate Bill 9 would essentially overrule a decision from the Illinois Commerce Commission, a regulatory body that approves rate increases and is overseeing the implementation of the smart grid plan, which became law in 2011. Lawmakers say the ICC misinterpreted the law. They say the resulting ruling could cost Commonwealth Edison an estimated $100 million annually and forced Ameren to reduce its rates by just under $50 million. The utilities want the money back, plus interest. Under the smart grid legislation, which became law after legislators voted to override a veto from Gov. Pat Quinn, Ameren and Commonwealth Edison committed to investing more than $3 billion in the state’s electrical grid over 10 years. Under the law, ComEd is required to create 2,000 new jobs, and Ameren is required to create 450 jobs over the same period. ComEd has already created 700 new jobs under the plan. The utility has also installed 500 “smart switches” that help to prevent power outages and completed 500 projects to strengthen the grid against storm damage. But the utility companies claim that they cannot move ahead with the investments and further job growth unless the ICC ruling is reversed. “ComEd is proceeding with a portion of the core grid modernization programs, while postponing the deployment of the remainder and all smart meters until 2015. SB 9 would allow us to get the Smart Grid program — and the related job creation — back on track,” said Anne Pramaggiore, ComEd president and CEO. A spokesperson for Gov. Pat Quinn said he plans to “thoroughly review the bill.” A representative of the governor filed as an opponent to the bill at a House committee hearing Wednesday. For more on Smart grid see Illinois Issues July/August 2011. The Illinois Senate rejected a comprehensive pension proposal today, opting instead to approve benefit changes that would apply only to teachers. Allow cost of living adjustments [COLAs] on only the first $25,000 of a retiree’s pension, or on only $20,000 for those who receive Social Security benefits. COLAs would not kick in until a retiree turns 67 or five years after retirement, whichever comes first. Guarantee that the state make required annual payments to the pension systems. Sponsor Sen. Daniel Biss, a Democrat from Evanston, said the proposal would cut the state’s required pension payment by about $2 billion, reduce the unfunded liability by almost $30 billion and reduce total payments by about $150 billion. The unfunded pension liability is currently estimated at $96 billion. Opponents argued that the bill clearly violates the pension protection in the state’s Constitution but that for the state to uphold other constitutional obligations, such as funding education and ensuring public safety, the state must be allowed to reduce retiree benefits. Republicans who spoke in favor of the plan agreed with Biss. “We all know what a vexing problem this is. And no matter what we do, it’s going to be painful to someone,” said Minority Leader Christine Radogno. “We have a lot of great ideas here, but I think at this moment, this is the best, most comprehensive plan that we’ve seen to date, that tries to treat everyone fairly.” A dozen Republicans and 11 Democrats voted in favor of the bill. Radogno said she was disappointed with the outcome. Under SB1, current teachers would be offered a choice. They could opt to give up their compounded-interest cost-of-living adjustments (COLAs) for access to the state’s health plan and access to a cash balance retirement plan in addition to their current benefits. Employees who opted to keep their COLAs would have their pensionable salaries frozen, so no future raises could be considered for benefits. Cullerton said he removed retired teachers and those who have already given notice that they plan to retire, because most would not opt to reduce their COLAs. So, he said, including them would not produce substantial savings. “We’ve reached a crossroads. We’ve had enough debate on these issues. Now it’s time to pass a bill,” Cullerton said on the Senate floor. Republicans said Cullerton’s bill is not comprehensive and would not save enough money. “If we’re going to do it, let’s do it. Sen. Biss’ bill saves us seven times more money than this,” said Palatine Republican Sen. Matt Murphy. Advocates for early childhood education, bilingual education and homeless student assistance programs appealed to Illinois lawmakers today to restore some funding cut in previous years. Early childhood education advocates asked for the biggest restoration of funds, $25 million to an early childhood block grant. Under Gov. Pat Quinn’s proposed budget for Fiscal Year 2014, early childhood education would be spared further cuts like those enacted in prior years, and current funding levels would be continued. Citing the importance of early childhood education, Morgan County Sheriff Randy Duvendack said the state was not providing adequate funding. Duvendack said early childhood education in schools was necessary for the development of “critical, early social skills” for young, disadvantaged children to discourage criminal activity later in life. He said cuts to state funding meant that about 22,000 children were dropped from state-supported preschool programs since 2009. Torres also testified in support of funding for bilingual education programs. He estimated 304 schools in 88 counties across the state had children who do not speak English as their primary language. In 2012, Torres estimated that the number of students in the state for whom English is a second language grew from 146,000 in 2004 to about 200,000 in 2012, while funding from state state government has remained flat since 2011. Patricia Nix-Hodes of the Chicago Coalition for the Homeless asked for $3 million that is not included in Gov. Pat Quinn’s budget to provide support for homeless students to remain in school. She said the homeless student population is also growing, and that money to fund staff is needed to provide services to ensure that students are able to attend school on a regular basis. A judge today sided with the state in a disputed over the cost of public retiree health insurance. Last year, lawmakers approved and Gov. Pat Quinn signed a measure to allow the state to begin charging retired workers premiums for their health care. Many retired state workers and university employees do not pay premiums if they worked for more than 20 years. Those retirees are required to pay for coverage for family members, along with co-pays and other out-of-pocket costs. Gov. Pat Quinn’s administration said retirees should expect to start paying premiums after July 1. “I am pleased with the court’s action today to uphold this important law. This is good news for the taxpayers and another step forward in our effort to restore fiscal stability to Illinois,” Quinn said in a prepared statement. Union officials say Cullerton’s plan presents a coercive choice and does not offer employees something of value in exchange for benefit cuts. AFSCME also announced today that its members ratified a new three-year contract with the state. A tentative agreement was reached last month, after more than a year of negotiations. Under the deal, employees will receive back pay from raises that Quinn previously froze. They will take a pay freeze for the current fiscal year but would see 2 percent increases in the last two years of the contract. Workers also agreed to pay higher premiums, co-pays and deductibles for their health care. Quinn estimates that the move will save the state about $900 million in employee health care costs over the life of the contract. “This new contract takes into account the state’s fiscal challenges, while also recognizing the vitally important work state employees do,” Bayer said. While the Illinois House debates gun control issues each week on the chamber’s floor, the Senate is trying to tackle the issue in a more low-key fashion. The House today rejected several amendments that would apply to the concealed carry of weapons in public. A federal court has given the state until June to approve concealed carry legislation. Today, House members voted down provisions that would require those with concealed carry licenses also to hold $1 million in liability insurance, limit licensees to carrying a single gun and require concealed carry applicants to complete training with the gun they plan to carry. The chamber approved a couple of amendments, including one that would ban guns in bars. But some House members say the approach is helping to sort through a large number of proposals on a politically difficult topic. “If the goal for the gun debates is to see what there’s support for in the chamber, then we’re accomplishing that goal. Obviously there’s things that pass and things that don’t, and that’s I think informing the ultimate goal,” said Rep. Elaine Nekritz, a Northbrook Democrat. Raoul said he and Dixon Sen. Tim Bivins, who was tapped by Republican legislative leadership to take up concealed carry, are working to try to find a bill “that can pass and can deliver to the citizens of the state of Illinois, with varying views, a gun public policy that’s acceptable.” According to his staff, Bivins is ill today and not available for comment. He was excused from legislative session today. After Gov. Pat Quinn asked for a 5 percent reduction in higher education spending, the first university to appeal to lawmakers during the budgeting process asked to avoid cuts. For the past several years, funding for higher education has remained both static and slow in coming. The state delayed higher education payments owed to universities because it did not have the money to immediately pay them. Universities have been waiting in line for payments, as have K-12 schools, Medicaid providers and vendors that provided services to Illinois. With this in mind, Eastern Illinois University’s president, William Perry, said he came to the Capitol attempting to show good faith by asking to keep the university’s general state funding at the same level as last year, about $44 million. Eastern is also asking for $80 million in capital funding to build a science center on campus. Perry said the university increased student fees to cover some of the construction costs. This request was not included in Gov. Quinn’s proposed budget, according to his office. Perry said the university is trying to control its own costs by reducing some administrative positions. He also noted that students voluntarily increased some campus fees to raise money for a portion of the proposed building’s estimated cost. He said EIU has simply worked around the state’s delayed payments and that its first priority was continuing to offer its degree opportunities to students in a tightening fiscal climate. “The quality of our programs has not been diminished, so we’re managing it,” he said. Perry said the university had to pre-plan for some uncertainty with various sources of funding. “As with any state agency, you do what you can with where you are, and if state funding goes down, we’ll figure out a way to work with it and manage it,” he said. The committee’s chairman, Sen. Dan Kotowski, a Park Ridge Democrat, said he was grateful the university “did their homework” and did not ask for extra appropriations from the state budget. “Unfortunately, we're in a really difficult position financially,” he said. "We are going to do our best to make sure that [avoiding cuts] happens. Education can't keep taking these hits that it has,” he said. “What is realistic is the level of support for funding, a stable level of funding for education." Sen. Chapin Rose, a Mahomet Republican, said the pension issue was a "missing" piece to the discussion that would crowd out funding for items such as higher education if not properly addressed. “To be brutally honest, if the pension payment keeps going up … each year, it’s not just higher education, it’s everything [facing cuts],” he said. The Illinois House approved two changes to the public employee pension system, but supporters of pension reform say there is still work to be done to reach a comprehensive solution. Over the past few weeks, the House took several test votes on various amendments that contained pension changes. Today, the chamber passed two bills and sent them over to the Senate, which is having its own debate over the constitutionality of proposals to cut benefits for state workers and retirees. A Senate committee approved two other pension bills yesterday. The House passed House Bill 1154, which caps the amount of salary that will be considered for pension benefits. The bill would limit the amount of pensionable income to the Social Security wage base, which is $113,700 in 2013, or the employee's current salary, whichever is greater. HB 1166 also passed. The proposal would increase the retirement age for employees younger than 46. Employees from 40 to 45 would see a one-year increase, employees 35 to 39 would see a three-year increase and employees 34 and younger would see a five-year increase. Republicans supported both measures, but House Minority Leader Tom Cross said he was concerned about the process of passing proposals individually instead of approving a comprehensive plan. “This is for all practical purposes, legislating by multiple choice. What I find troublesome about this process is that this is perhaps the biggest issue that has ever faced the ILGA from a financial perspective, and there’s no road map that’s been laid out for where we’re going,” Cross said on the House floor. “I hope that we’re not setting the stage where we’re sending a series of different bills to the Supreme Court, and not in one big package, which I think could cause a lot of mischief for this issue and this problem.” Cross voted in favor of both bills. Union leaders maintain that all the proposals the House is considering, and the two approved by the Senate committee yesterday, are unconstitutional. “We believe that the best approach to constitutionality is by negotiating with the stakeholders,” said John Cameron, political director for the American Federation of State Local and Municipal Employees Council 31. Nekrtiz and Cross are co-sponsoring a comprehensive bill, HB 3441. Both of the bill’s the House passed today are components of the plan, and a House committee approved HB 3441 after today’s floor votes on the other two bills. A day after House Speaker Michael Madigan said he supports a ban on hydraulic fracturing in Illinois, supporters of a bill to regulate it say they have reached a deal with the industry. Madigan told reporters yesterday that he supports a moratorium on the practice, commonly referred to as fracking. It is achieved by pumping water mixed with sand and chemicals through a well into rock that holds a carbon fuel, such as oil or natural gas. The sand holds the cracks open so the gas and/or oil can be extracted. Horizontal drilling allows gas and oil companies to drill down into the Earth and then permeate rock along a horizontal line, which is sometimes miles long. Industry experts say that it is likely both oil and gas will be extruded from fracking wells in southern Illinois, where drilling companies have spent about $150 million to lease mineral rights. “Until you really get down there and drill, you don’t know what’s going to come up,” said Mark Denzler, representing the Growing Resources and Opportunity for the Workforce in Illinois coalition, a business group supporting fracking in the state. Madigan referred to the fallout that fracking has caused in other states, particularly Pennsylvania, where methane leaked into drinking water wells. “Read about what happened in Pennsylvania,” he said. Methane is not toxic but is dangerous at certain levels because it is flammable. Negotiations over fracking regulations in Illinois have been going on for years. A regulatory framework in the Senate passed last year with no opposition. However, the plan fell apart in the closing days of the legislative session because a deal could not be reached over the fees and taxes that well operators would pay and last minute consideration of proposals to temporarily ban the process while a task force conducted research. After Madigan’s talk to the press yesterday, industry representative met with Bradley and came to a deal on the taxes and fees. Denzler, who is also vice president and chief operating officer of the Illinois Manufacturers’ Association, said the state stands to gain an estimated $200,000 in revenue per well. He denies that industry concerns over Madigan’s statement pushed the negotiations. “I don’t think so. We’ve been negotiating on this for three years and focused on the revenue for about three weeks. So we were actually very close. We were close to an agreement before the comments yesterday, and we were hoping to get an agreement reached so the bill could move this week,” Denzler said. “I think we would have gotten the agreement yesterday regardless of comments that might have been made.” Operators would pay $13,500 in fees for each well. $11,000 would go to the Department of Natural Resources, which would oversee licensing, and $2,500 would to the Illinois Environmental Protection Agency. Supporters say they do not expect the speaker’s stance to stop the bill from being approved in the House. “We feel really good about the package, and we’re moving it forward,” Bradley said. Environmental groups were encouraged by Madigan’s words. “We absolutely support the speaker’s call for a moratorium. ... That remains our first choice. That remains the safest thing for the state of Illinois to do, but if that doesn’t pass, we have to do whatever we can to protect ourselves,” said Jack Darin, director of the Illinois chapter of the Sierra Club. Darin and representatives of other environmental organizations have been criticized by some southern Illinois community groups for coming to the table over regulation instead of taking a hard line stance on a moratorium. An Illinois Senate panel today approved two pension reform plans while the House continued to debate gun control issues. The constitutionality of both pension bills was argued from all sides during the hearing, which lasted more than three hours. But as the debate continued, one thing became clear: Supporters of pension changes are still a long way from having a plan that can pass in both chambers. Increase public employee contributions by 2 percent of their salaries. The increase would phase in over two years. Allow cost of living adjustments (COLAs) on only the first $25,000 of a retiree’s pension, or on only $20,000 for those who receive Social Security benefits. COLAs would not kick in until a retiree turns 67 or five years after retirement, whichever comes first. Increase the retirement age for employees younger than age 46. Employees from 40 to 45 would see a one-year increase, employees 35 to 39 would see a three-year increase, and employees 34 and younger would see a five-year increase. The measure has the backing of the Civic Federation, a nonpartisan think tank in Chicago. “We believe it is a comprehensive and bipartisan pension reform proposal that would help the state of Illinois greatly. By any reasonable assessment, the state of Illinois is in an extraordinary financial crisis. The primary driver of this crisis is the state’s inability to pay for its huge and growing pensions cost,” said Laurence Msall, president of the Civic Federation. Supporters of the bill say that the dire state of Illinois pensions systems, which are about 40 percent funded, justifies a move the reduce current workers' benefits to stabilize the system. The state Constitution protects the benefits from being “diminished or impaired.” They argued that the alternative to reducing benefits would be insolvency and an inability of the state to pay out future benefits. But opponents say SB 1 would not create enough savings and that the cost of employee health care is too much of an unknown. Cullerton said the measure would not guarantee that the state would pay future health care costs; the option being offered to workers is merely guaranteed access to the state’s group health insurance plan. Supporters of SB 35 say that SB 1 would muddy the legal argument behind their proposal. “We can’t let politics dictate this. We have to solve a problem but only go as far as necessary to solve the problem, and when you put them both in the same bill and one saves $28 billion off the unfunded liability and the other one saves $11 [billion], I would say under that construct that Plan A can’t survive because on its face, it looks like we’ve gone further than we need to," said Northbrook Democratic Rep. Elaine Nekritz. She is sponsoring the House plan that is the same as Biss' bill. She plans to present the proposal to a House committee tomorrow. Union officials believe that both plans are unconstitutional. “What we have are questions of funding. The state takes in money. It spends money. What we’re witnessing is a change in fundamental priorities in how the state spends its money, ”said John Stevens, a lawyer advising the We Are One Coalition. He said that the pension clause was added to the 1970 Illinois Constitution to protect benefits at a time when they system was funded at level similar to what it is now. “Under Illinois law, it is not appropriate to diminish benefits” without engaging in bargaining with public employee unions. Stevens said the consideration in Cullerton’s bill is a false choice that does not offer workers something in exchange for a reduction in retirement benefits. “In either case, you’re giving up something on both sides of the equation. You do not get something for something,” he said. Biss said that there is still work to do. “It’s a hugely difficult, hugely complicated — ethically complicated, legal, complicated, mathematically complicated, economically complicated problem. So there’s different views, and we’re just going to work through it until we can all get to a bill” that can pass in the legislature, be signed by Gov. Pat Quinn and upheld by the courts. He said he is not expecting a floor vote on either proposal when the Senate is back in session Thursday. “It’s unclear at this point. My guess ... is they will not [be called for a floor vote tomorrow.] But a lot of discussion still has to happen." Meanwhile, the House continued its long slog of taking test votes on gun control proposals. The House rejected a proposal that would have required Firearm Owners Identification (FOID) Card applicants to get a psychiatric evaluation as part of the application process. An amendment that contains a proposal that would require gun owners to report lost or stolen guns was approved. However, no legislation was passed out of the chamber. Some Illinois schools are considering moving to four-day weeks to cope with budget cuts, according to the Illinois State Board of Education. In its Fiscal Year 2014 proposed budget, the state board is requesting an increase of $874 million from the current fiscal year. According to the ISBE, pre-K through 12 education has been cut by $861 million since FY 2009. The board says general state aid to schools has been reduced by 7 percent, more than $320 million, since FY 2009. Under Gov. Pat Quinn’s budget proposal for next fiscal year, K-12 education would be cut by more than $275 million from current fiscal year levels. Quinn has called for early childhood education to be spared from cuts. Quinn says the reductions are needed because of the growing costs associated with the state’s underfunded pension system. The state’s required pension contribution this year was nearly $6 billion. “Skyrocketing pension obligations leave our state with no choice but to continue reductions to our core priorities,” Quinn said in his budget speech last week. A coalition of Illinois groups opposed to horizontal hydraulic fracturing is pushing for a ban on the practice in the state. Lawmakers, regulators and many environmentalists agree that it is coming to Illinois. Oil and gas companies and have spent hundreds of thousands of dollars leasing mineral rights in southern Illinois. House Bill 2615 seeks to regulate the practice and has a broad group of supporters. “There’s kind of a gold rush mentality surrounding all of this isn’t there? But what happened after the gold rush? Ghost towns,” said Rich Whitney, who is on the legal committee for Southern Illinoisans Against Fracturing Our Environment (SAFE). A group of anti-fracking activists that rallied at the Capitol today say they reject the prevailing belief that fracking in Illinois is inevitable, and they are calling for a two-year moratorium on the practice. “Fracking is not inevitable, and it is offensive to suggest that is inevitable without hearing from the people first and hearing what their concerns are. They’re very legitimate concerns,” said Whitney. Senate Bill 1418 and HB 3086 both call for a two-year ban on fracking and the creation of a task force to study the issue. Whitley, who ran as the Green Party candidate for governor in 2006 and 2010, took Gov. Pat Quinn to task for highlighting fracking in his budget address. "Hydraulic fracturing, commonly called fracking, is coming to Illinois, with the strongest environmental regulations in the nation,” Quinn said. “This legislation has the potential to create thousands of jobs in downstate Illinois. It will also ensure that our natural resources are protected for future generations.” Quinn encouraged lawmakers to approve HB 2615 this year. Several environmental groups support HB 2615. However, the say they would also be open to a moratorium. Jack Darin, director of the Illinois chapter of the Sierra Club, said most groups just want to make sure that if fracking comes to Illinois, there is a regulatory plan in place. “In the environmental community, we have a lot of concerns about what fracking is going to bring to Illinois, and when we look at some of the controversies that have happened in other parts of the country, there’s a real need for us to prepare for that,” Darin said. However, Environment Illinois, which describes itself as a citizen-based environmental advocacy organization, has joined the call for a moratorium. Bruce Ratain, state policy associate for Environment Illinois, called fracking a “rolling environmental disaster” across the country. Ratain pointed to incidents that occurred in the last two months. A fracking well operator in Ohio was accused of illegally dumping thousands of gallons of chemical-laced wastewater and contaminating the Mahoning River. A broken well-head near the northern Colorado town of Windsor spilled an estimated 84,000 gallons of contaminated water. In a rural northeastern area of West Virginia, a worker was killed by an explosion on a drilling site. Doctors will have to pay more in fees so a state agency can continue to investigate and license them. Senate Bill 622 passed on a 65-49 vote today, with two voting present. The legislation has already been approved by the Senate, and Gov. Pat Quinn plans to sign it. UPDATED FRIDAY MARCH 8: Gov. Quinn has signed the bill. The law and new fee took effect upon the governor's signature. Because it was low on funds, the Department of Financial and Professional Regulation recently transferred 18 of the 26 staffers responsible for licensing physicians. Lower staffing levels created a backlog of applications and left fewer investigators to look into malpractice claims. If the licensing process remained funded at current levels, delays in processing were expected to be problematic for incoming medical students starting their residencies in July. “Right now, they are hard-pressed to do anything in the arena because there are not resources in the department,”said the House bill’s sponsor, Rep. Barbara Flynn Currie, a Chicago Democrat. She said without a fee increase, the wait time for licenses could be up to a year. SB 622 would borrow $6.6 million from the Local Government Tax Fund to cover immediate costs. The money would be repaid by 2018. Currently. doctors pay $300 every three years to be licensed in the state. The measure raises fees to $700 paid every three years through 2018 to allow the department to rehire cut staff and be able to repay borrowed funds. At that time, fees would drop to $500 every three years. The increase would be the first time fees have been changed since 1987. Susan Hofer, spokeswoman for the Department of Financial and Professional Regulation, said the agency was “relieved” it would be able to start speeding up the application process. In a prepared statement, the Illinois Medical Society said the legislation is shortsighted. “Better solutions were left on the table.” The group has acknowledged that a fee increase is needed but also wants the money from the sweeps paid back. The Illinois House voted today in favor of a cap on the amount of salary that can be used to determine benefits for public employee pensions. The proposal would cap the amount of salary that benefits are based on at the level of salary on which Social Security benefits are based. That number is tied to a federal measure of inflation. This year, it is $113,700. Employees who currently make more than that would see their pensionable salary capped at its current level. Supporters estimate the change could save $1 billion. Northbrook Democratic Rep. Elaine Nekritz, who has been spearheading pension reform efforts in the chamber, said she was “thrilled” at the approval of the proposal, which is a component of legislation she is sponsoring. House Bill 3411, which Nekrtiz co-sponsors with House Minority Leader Tom Cross, would also require employees to contribute 2 percent more of their salaries toward their retirement, and cap the amount of pension benefits on which cost of living adjustments (COLAs) would be applied. Nekritz and Cross intend to present the bill in a House committee next week. “I think it demonstrates that the process that we’re going through — we don’t have to be so cynical about it — it can get us to a solution,” Nekrtiz said of today's vote. The House soundly rejected two other measures today. One would have frozen the cost of living adjustments for retirees for 10 years. It got two “yes” votes. Eleven House members voted in favor of the other proposal, which would have required employees to contribute 4 percent more of their salaries toward their retirement costs. House Republicans generally refused to participate in the process. All but two did not cast votes on any of the pension amendments considered today. They took the same approach last week when Democrats ran several other proposed pension changes through the same process. “We feel that this issue is far too important to try to piecemeal a bill together,” said Sara Wojcicki Jimenez, a spokeswoman for Cross. She said Republicans instead prefer moving HB 3411 through the traditional legislative process. House Speaker Michael Madigan accused Republicans of shirking their responsibilities by refusing to cast votes. “The Republicans, I think, made a mistake. So they’re elected, and their electors tell them to come here and to vote. They don’t tell them to come here and not participate,” Madigan told Jak Tichenor, host of public television’s Illinois Lawmakers. Nekrtiz said she thinks the process is helping her colleagues understand the individual components that may eventually make up a plan to change pensions. “I think it’s working. I really do,” she said. Gov. Pat Quinn laid out some concepts for changes to the state's underfunded pension systems in a budget that he says is the “most difficult” he has presented to lawmakers. However, the House has already decided that when a final budget is enacted, it will contain less spending than Quinn’s plan. “I thought he was pretty firm in his tone,” said House Minority Leader Tom Cross. He likened Quinn’s address to a parent giving a lecture. “His tone was fairly strong, and I think he focused on where he need to on the need to reform the pensions system. It is the issue of the day. ... I think he was right in making that the focus of his speech. I agree with him.” Senate Minority Leader Christine Radogno said that she “agreed with the governor” that it is “time to vote” on changes to the pension system. However, she said it was unfair of Quinn to lay the blame on lawmakers. “Most of the work that has been done on pensions has come out of the General Assembly, and not out of the governor’s office,” she said. Union leaders said that creating an impression that the only choices out there are deep education cuts or reductions to retiree benefits is dishonest. “It is unfair for Gov. Quinn to present this false choice between pensions or pencils. Springfield lawmakers created the massive pension debt by skipping payments and borrowing more. To call that debt an education expense is not only a gimmick, but an insult to teachers everywhere. We are not to blame, and our students shouldn't suffer,” Illinois Federation of Teachers President Dan Montgomery said in a prepared statement. Senate President John Cullerton said he plans to push members of his chamber to present pension reform proposals. “This reality reinforces why pension reform remains my top priority this session. For that reason. I have notified all pension reform Senate sponsors to present their bills before the Senate Executive Committee within a week,” Cullerton said in a prepared statement. “I am also working to identify new revenue sources for education and priority programs. I believe that a gaming plan that is structured to address the ethical and regulatory concerns of Governor Quinn can be part of a new revenue mix. I look forward to working with each caucus to advance more solutions for our funding shortfall.” A Senate committee approved a gaming bill after Quinn’s speech. According estimates from Senate Democrats, the proposal could bring in $200 million to $400 million in revenue for schools, more than $50 million each year for pension costs and almost more than $300 million in upfront licensing fees that could be spent on overdue bills. The plan calls for a ban on campaign contributions from gaming licensees. The proposal is also a massive expansion that would create five new casinos, allow slot machines at horse racing tracks and airports and create an online gambling system under the Illinois Lottery. Under the so-called i-gaming proposal, residents could bet online. In the past, Quinn has recoiled at large expansions. A spokesperson said that he is “reviewing” the proposal. Quinn is proposing a $400 million cut to education, which includes K-12 and higher education. Under the proposal, K-12 spending would be cut by more than $275 million. The bulk of the reduction would fall on general state aid to schools, which would be reduced by $150 million. General aid was cut by $161 million under the current state budget. Higher education would take an $83 million hit. In his speech, Quinn did not focus on the details of what the reductions would mean for schools. Children’s advocates were disappointed with the proposal. “Gov. Quinn’s budget proposal demonstrates that Illinois’ fiscal crisis is far from over and that children, families and communities continue to pay the price for a history of unwise fiscal decisions made by our elected officials. Nearly every area of the budget that impacts children has been subject to deep cuts over the past few years,” Gaylord Gieseke, president of Voices for Illinois Children, said in a prepared statement. 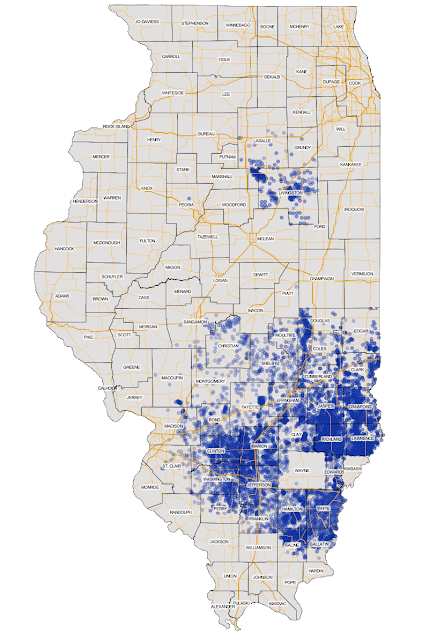 Quinn's plan would not cut early childhood education or Monetary Assistance Program (MAP) grants for low-income college students. But the cuts may be even deeper in the plan that is ultimately approved by lawmakers because Quinn and the House started their budget planning from two different points. The governor’s budget office estimated the state would have $35.6 billion to spend, but the House yesterday approved a resolution intended to cap spending at $35.08 billion. Quinn’s plan also calls for lawmakers to reassess automatic transfers out of the General Revenue Fund “Our revenue estimates are based on real numbers. ... They’re based on facts. They’re based on evidence. They’re cautious numbers. They take a pragmatic and reasonable approach, and I don’t know where the governor’s numbers come from,” said Marion Democratic Rep. John Bradley, who chairs the committee that produced the House’s estimate. Gov. Pat Quinn’s proposed state budget would continue to chip away at Illinois' overdue bills, but he hopes lawmakers will agree to eliminate corporate tax breaks and use the proceeds to pay down some of the state’s current backlog. Quinn said that under his plan, $2 billion in late bills would be paid down during the current fiscal year and the next. His budget projections estimate that the backlog, which is now more than $8 billion, would be $6.8 billion by the end of Fiscal Year 2014. He proposed further measures to make a larger dent in the backlog. Doug Whitley, of the Illinois Chamber of Commerce, opposes Quinn’s proposal. “I find it troubling that on one hand, the governor wants to improve the business climate ... [and then tells business], ‘Oh, and by the way, how about turning around and kicking in [more taxes],’” he said. Rep. Ester Golar, a Chicago Democrat, said the focus should be on those who are waiting on payments from the state. “We have to pay the individuals who have not been paid,” she said. Golar said she plans to introduce a bill calling for the state to borrow money to pay down the backlog. She proposed $4 billion in borrowing at the end of the last legislative session. Quinn has backed such plans in the past but has since moved away from them after they failed to gain traction with lawmakers.